Thoughts of summer conjure up Wimbledon, garden parties, fetes and weddings. Colourful berries and champagne reign supreme. Hotel Chocolat knows this and their box of delights covers both. You’ll find melt in the mouth champagne truffles, fruity flavours and a lolly. You can’t have summer without a lolly. The flavours are exquisite and there are a few surprises to be had too. As you’d expect from a collection though, there is more to it than just berries and champagne. You’ll find something here that will appeal to most tastes with a mix of solid chocolate, smooth mousses and sumptuous truffles covered in white, milk or dark chocolate. I was sent the Hotel Chocolat Summer Collection to try and more importantly, I have one to offer up as a giveaway to my UK readers. You’ll find out how to enter at the bottom of this post. The box comes in cool colours to beat off that summer heat – we should be so lucky! It’s tied with a white ribbon and is decorated with a cocoa pod and leaf motif; it’s sturdy enough to be reused. The chocolates arrived in perfect condition as all are well packaged, with most of the packing material being recylable. The collection retails at £35. So, what exactly will you find in the Hotel Chocolat Summer Collection? Here goes. White chocolate is rarely a favourite with me, I generally find it to be just too sweet and sometimes a bit cloying. The six Cherry Jubilee chocolates turned out to be one of my absolute favourites and poor CT didn’t get a look-in. The flavours and textures of these chunky squares married together extraordinarily well I found. A layer of sour cherry cream is topped with crispy praline and then covered in smooth white chocolate. White chocolate does pair well with fruit and the sour notes of the cherries offset the sweet creaminess of the chocolate very nicely. A pack of eight pretty pink, yellow and dark chocolate domes. The secret raspberry here is pure genius. It’s not, as I’d assumed inside the chocolate, no that is reserved for the passionfruit cream, which tastes of actual passionfruit – hooray! The raspberry is in the 70% dark chocolate shell. These are a taste sensation made for people like me who adore both raspberries and passionfruit. Tart fruit and rich chocolate combine to make something that is akin to how I imagine chocolate sherbet would be. These nineteen chocolates are best served chilled, according to the instructions. There was no danger of these being served in any other way as it’s been so grey and chilly here over the last few days. Thank goodness for a box of chocolates filled with the flavours of summer and a fair bit of alcohol too. There is something in the box to suit different flavour preferences, but given that there is only one of most of the chocolates, you might want to sample them all yourself – in the spirit of experimentation you understand! You’ll find mostly fruity numbers in this box, including the afore mentioned cherry jubilee and secret raspberry, although the latter is actually called passion fruit and raspberry smoothie this time around. The creaminess of white chocolate can offset the sharpness of some fruits and seven of these chocolates are enrobed with it. Other fruit flavours include: lemon, lime, blackcurrant, strawberry and mango. Banana is an unusual chocolate filling and I was slightly dubious before I tried the banana smoothie. It turned out, of course, to be a firm favourite. A smooth intense banana cream combines beautifully with the 40% milk chocolate shell. Not everything in this box is fruity, however, champagne, fudge, ganache and chocolate mousse all make an appearance. As previously mentioned, alcohol plays a starring role. The mojito, for instance, packs a powerful punch. Filled with a smooth rum and mint cream, the lime seems to reside in the white chocolate shell and is thoroughly delicious. This 110g bag of puddles consists of bite-sized milk chocolate discs flavoured with caramel that are made to fit perfectly in the roof or your mouth. That’s my favourite way to eat them anyway. Savoured like this, they melt ever so slowly and flood the tastebuds with varying notes of chocolate and mellow caramel. Just wonderful. A Hotel Chocolat Summer Collection would not be complete without a lolly and a chocolate lolly is my kind of lolly. This two toned 36g flavour bomb on a stick is where zingy raspberry meets creamy milk chocolate flavoured with caramel. What more can I say? This 85g bag contains fifteen exquisite balls of delight. If you like champagne and chocolate, you will adore these. Milk chocolate shells are dusted with a little icing sugar and filled with milk chocolate ganache flavoured with real champagne. You can taste it too. I was sent the Hotel Chocolat Summer Collection for review purposes. I was not required to write a positive review and all opinions are, as always, my own. Hotel Chocolate is kindly offering one Tin and Thyme reader a Hotel Chocolat Summer Collection box worth £35. To be in with a chance of winning, please fill in the Gleam widget below. You will need to leave a comment on this post, answering the question, which then gives you additional chances to enter if you so wish. Gleam will pick a winner at random from the entries received who will then be contacted via e-mail. If you are commenting anonymously, please give me some way of identifying you as I will be verifying the validity of entries. Any automated entries will be disqualified. This giveaway is only open to those with a UK postal address. Winners will need to respond within 5 days of being contacted. Failure to do this may result in another winner being picked. There are no cash alternatives. The Summer Collection is offered and provided by the Hotel Chocolat and Tin and Thyme accepts no responsibility for the acts or defaults of said third party. Tin and Thyme reserves the right to cancel or amend the giveaway and these terms and conditions without notice. First anniversary with my boyfriend as he loves chocolate! Wow! Would love this so much! Hotel chocolat are the absolute best! ! hotel chocolat just opened in my town– so happy!! I should not eat chocolate but this is simply irrestible and I must have it. Happy Birthday to your mum Tracey. Good luck. I would love to win this for my parents who are celebrating 45 years of marriage this Summer! Wow, 45 years is some going. Congratulations from me and good luck to you. My husband loves chocolate and he has just got a new job, starting next month, so these would be lovely for him. I’d save them for everyone to enjoy after an afternoon BBQ in the garden. As a gift to my wife to say I love her. I would give them to my friends from The Ukraine at Christmas. It’s my daughter’s birthday in August so these would be ideal to share round after the family BBQ. I would love to share with Hubby of 51 years who has just had to give up canoeing because of poor health – he is a Sweetie! I’d love these for mine & the boyfriend’s 6 year anniversary at the end of this month! What a yummy way to celebrate! I would love to eat these all to myself as a gift to me. As I think my house is haunted by a chocolate eating ghost, they vanish and nobody knows anything about it So these would have to be well hidden or I’m going to have to call The Ghostbusters!! Hmmm, we seem to have the same problem. Send them my way when they’ve sorted you out Julie. Hehehe Amelia. I think your husband’s 6th sounds good enough. I would love the collect to give to my little sister who just graduated! I think that these would be absolutely perfect for a birthday present for me! One of my oldest friends is over from the states in August. I’d love to get the girls round and put on an afternoon tea party (with some fizz too!) and round it off with a Hotel Chocolat extravaganza! I think they would be lovely to celebrate our wedding anniversary. I think it would arrive just in time for my parents 65th Wedding Anniversary! 65 years? Really? That’s amazing. I hope they have a wonderful time. i wouldnt need an occasion to enjoy hotel chocolat, i love them, but with my mums birthday coming up this month i would give them to her to enjoy as she works so hard looking after everyone she deserves a treat! I would like it for when I go visit my daughter and her partner in their new home. My sister’s birthday – she might even share some with me!! For me and my mum to celebrate her birthday! would love to win to celebrate my husband’s new job! I’d love to win these for my dad’s birthday. He’s so hard to buy for, but does love chocolate! Wow, I think they deserve something special for all those years. I hope they have a lovely day. My wedding anniversary is coming up later this month and I think these would be the perfect end to the day. I’m looking for some gifts for the end of year presents for teachers, and the one that always misses out is the school secretary so i’d give them to her. I would love these for my upcoming birthday as a gift. I love premium chocolates and these flavours sound amazing. It’s my hubby’s birthday very soon and these would make a lovely present for him. I’d give them to our friend Michèle, to help her keep up the good work she does with her bookshop in Liskeard. I’d like the Hotel Chocolat Summer Collection for sharing with family and friends who attend a tea party picnic birthday celebration. I’d declare a 100% Honey Day and lounge around on the sofa eating these, drinking cider and watching my favourite DVDs! I would love to treat my partner for his Birthday! It’s my housemates birthday coming up and he likes to share! Lovely selection to share with friends and family. BBQ in the garden with choccies for afters!! I’ve been invited to a party and this would be the perfect gift to take!! I would like the chocolate to celebrate all the “0” birthdays which are happening this July in my family. Gosh, July is some month for you Vicky. Luckily no 0’s for me this year. Oh I don’t think there needs to be an occasion, just plonk them on my knee and I’ll be very happy!!! For my husband’s birthday in august! He adores the champagne truffles! It’d make a lovely treat for my husbands Birthday – as long as he shares!! That’s a given Jo – surely!!! No particular occasion really. I just love chocolate! Maybe a nice film with my mum so we have a treat. I’m going to stay with my Norwegian friend in Oslo shortly and these would be great to take as a ‘thank you’ gift! Aghhh, the weather has been horrible Chanette. Hope you have better luck next time you try. I’d like to be able to share it at a family gathering later in the year – would put smiles on everyone’s faces! I would share them with our new neighbours who are building a house behind us. I would love to give these to my husband to thank him for being such a wonderful father to our 3 month old baby. As a thankyou to my dad, for helping me keep the garden under control. He loves hotel chocolat. For my best friends’ 10th wedding anniversary, so the bridesmaids can reunite and scoff lots of chocolate! Special occasion for chocolate? How about surviving a day at work? Does that count? Oh, I think it very much counts Ann-Marie. Id save them for my housewarming party when im all settled. They would be perfect as an end of term treat for my sons. Ah wouldn’t it just Patricia. Congratulations on 47 years together. That’s some going. I would love the collect to celebrate my 30th birthday with! It looks super delicious, but not sure it would last until my birthday! As I don’t live in the UK I can’t enter. I do admire all the people who want to win and share with loved ones and friends but if I was able to win I would be thoroughly selfish and savour them all for myself. Or perhaps you are just being more honest 😉 You could always enter on behalf of someone living in the UK Mary and then feel highly virtuous. I would love the Hotel Chocolate Summer Collection for my daughter’s 7th birthday . As a thankyou to the head of early years at my children’s school, she is retiring this year after 38 years! this would be perfect for my sister’s 18th birthday next month! she loves chocolate! I would like it for my sons birthday at the end of the month. This would be perfect to celebrate our family’s July birthdays; my dad’s birthday, and my brother and I’s 5 days later on the same day! Happy Birthday Marie to you and your family. I’m a July baby too. These would be lovely for me and my husband to enjoy on our 25th wedding anniversary. it’s my mum’s birthday towards the end of july, this would make a fab treat for her. My husband’s 40th birthday is coming up so it would be lovely to have all these chocolate for that! It would indeed Corina. Happy 40th to your husband and good luck. Fab giveaway! would love to win but good luck everyone! These would be wonderful for my mums birthday at the end of the Summer! I’m about to celebrate my new job, so these would be fab with some champagne! Congratulations Milly. Hope it all goes well. It would be perfect to take my mind off the fact that we’re not really having a summer! It’s pretty rubbish isn’t it Natasha? Crossing fingers things will improve. I would love to win this for my parents who are celebrating 49 years of marriage. They would be perfect for mom and dad’s 56th anniversary party. Would go down really well for our anniversary at the end of July. A little treat. Ooh that sounds exciting Jane. Hope you all have a fabulous time. I’ve said it before and no doubt I’ll say it again. July’s babies are the best 😉 Happy Birthday to your dad. I think it would be the perfect gift to give to my parents for their wedding anniversary. I have a summer birthday, so these chocolates would be a birthday treat for me! Oh good luck Suelle, these would be a lovely birthday treat. Oh lovely, a niece to be proud of. I hope it goes well. why does there have to be an occasion? I think hotel chocolat is good any day of the week! Perfect finish to our family barbecue out in the garden. These would be thoroughly appreciated and enjoyed at our family get together this Summer. My graduation in September! The only trouble is I would eat it all and I need to fit in my dress! Oh hooray, that’s good news and a celebration is definitely in order. the collection is perfect for a birthday or any general celebration. For my 7th wedding anniversary 🙂 We don;t do anything special and this would be a lovely treat! The chocolates would be perfect for a tea party to celebrate or commiserate my Niece’s exam results and if she got into the university of her choice. To celebrate the summer holidays and hopefully my sons’s good SATS results. No real occasion, but would make for a special afternoon coffee with my parents. I know they would like to try them. I would love to give them to my mum for her birthday, she loves hotel chocolat and would be so happy!! I’d love to be able to give them to my brother for his upcoming graduation. I had a job interview today, I would love to celebrate with these if I got it, and if I don’t I can use them to cheer myself up! Good luck Hollie, I hope you got it. I would share them with my husband for our 12th wedding anniversary. my cousin paul is getting married in august. he was brought up like my brother. i’d love for you to cater at the reception! Now wouldn’t that just be perfect Karl – good one. I’d love to take them to a tea party at Buckingham Palace. They would fit in perfectly with the elegant surroundings – and I’m sure the queen would love them too ! 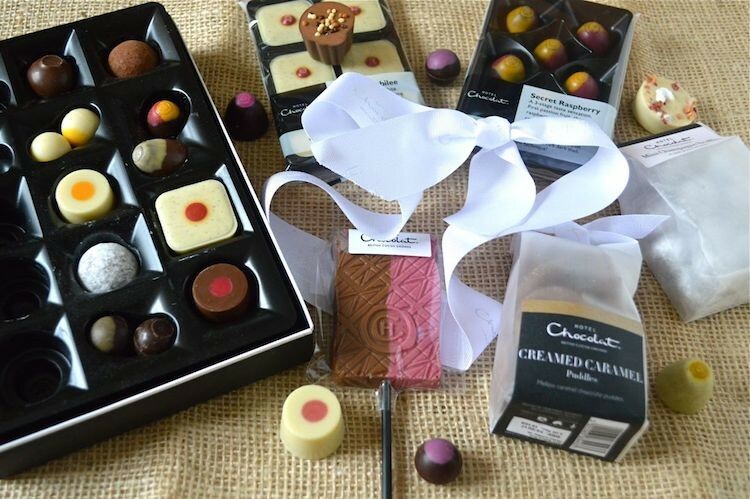 I love Hotel Chocolat so I would love to receive the summer Collection for my birthday which is coming up shortly. Thanks for the lovely giveaway. I like to save chocolate for a time when I’m bored, grumpy or its raining buckets… Then I put a movie on, get snuggly with a cuppa and crack open the chocolates! Sounds like a good plan Lindsey – good luck. I try and remember to share…. I’d love them for my first week at university, it would help me make friends for sure haha! This would be perfect for my Auntie & Uncle’s anniversary! I’d love it to celebrate reaching my target weight – I’ve lost 4 stone 2lb so far this year, just 12lb to go! Wow Emily, that must have taken some doing. Very well done. Thank you. I’ve tried the rest, now I’d like the best. An amazingly yummy prize! Fingers crossed for a win like this! I’d share them with my family. I wouldlove these for me and my twin sisters birthday next month! My birthday which is in September. Hope to win as I wouldn’t spend that much on chocolates for myself! Our whole family is meeting up in Plymouth this summer for a get together so this chocolate would be great to share around. I’ve never tried Hotel Chocolat before, shocking I know! Would love to taste them because I feel I must be missing out on something special!! You are indeed Sue. If you win, you’ll be in for a treat. Good luck. My next Birthday , to share with the family . My husband birthday and our wedding anniversary. This chocolate box set, would make a lovely gift for a birthday, Christmas present or house welcoming party. I would love these for my wedding anniversary! I would love to gift it to the physiotherapy department I attend weekly as a thank you! Oh lovely idea Alix. I hope you are well on the mend. They’d be a lovely treat for me and my husband to celebrate our 5th wedding anniversary with. I would like the chocolate collection to share around at my sons graduation party later this summer. My 50th later in the summer, I am having a garden party with afternoon tea. I would love these for my husband’s birthday. Would be great to take round to my friends baby shower next month. I would like a box of Pride-themed chocolates for June. We’re going out to South Korea for our lads traditional wedding this year and we need to take pressies for his new in-laws – this would be perfect! I would slightly chill my chocolates and enjoy in the garden with a glass of wine. A colleague of mine handed in her notice at work today, would love to add this to her leaving treats. I would be happy to use these to celebrate Boro’s first match back in the Premier League. I’d like to give it to my parents to celebrate their wedding anniversary! A present for one of my sisters or my mum, which one to pick though…! I would love these for my birthday, to share with the family of course. I’d like something dark and maybe a bit boozy to congratulate my sister in law’s new baby when he arrives. Oh dear, I know the feeling Julie. I’ve been after a new kitchen ever since I can remember! Congratulations and good luck. For my wedding anniversary in a lovely hotel room, with a bottle of Champagne. To take them to the summer get together in our close and greet our newcomer. It would be a great gift for my mother for her 70th birthday. I would eat them on ‘Underappreciated Babysitters Day’ (which I just made up), for always looking after my three nephews and niece and a very mischievous dog. I would eat them to celebrate the 29th Anniversary of the Garbage Pail Kids Movie. I would eat them to ease the pain of constant rain in Northern Ireland because they create that true moment of joy that no other brand of chocolate does. I have a friend coming back from the States soon, I’d like to remind her what proper chocolate tastes like! My housewarming, finally, after 9 years of trying to move ! They would be perfect for our 25th Wedding Anniversary. I’d give them to my daughter in law who has just presented us with a beautiful grandson – we are thrilled! Congratulations Jan, how very exciting to have a new baby in the family. I would share them with my son who did amazingly well in his end of year exams. They’d be great for when I go to visit my dad for the first time in a couple of years. For when I am having a bad day and need something to cheer me up! id share them with my husband one evening. These chocolates look absolutely divine! They would make a perfect treat to myself! i would like a few for my solo shopping trip into birmingham, for after my cafe lunch. I think I will need to eat them all myself to ease the stress of sending my youngest child off to secondary school! These would be wonderful to help celebrate our 20th wedding anniversary – the whole family loves chocolate and so this would be wonderful. I’m planning ahead here, I would keep them for me and my boyfriend for Halloween when the kids have goody bags of sweeties! It’s my birthday soon so would enjoy them as a birthday treat myself! I’d snuggle on the sofa with my husband kids and a large latte. We’ve just had our 21st wedding anniversary so it would make a nice extra treat. For our big family BBQ get together. Trying to get a date we can all do though means it will probably be imaginary! I would like to enjoy them on my birthday! My mum and stepdad are coming over from South Africa, I can imagine sitting around catching up while eating these and drinking coffee. To be the worlds most popular the partner…… Or the worlds happiest chocaholic? Would be absolutely fantastic to serve as part of a huge garden party. I would love these chocolates for a lovely girly picnic with my friends this summer!! My daughter’s 30th birthday. She’s had a rotten year, so it’s doubly important. For my sons girlfriends birthday to celebrate it in yummytastic style. Me and my friend love sharing a box of Hotel Chocolat chocolates over a bottle (or two) of prosecco, what better occasion is there? For my Golden Wedding Anniversary which is later this month (20 August) – what a lovely collection! My Nana’s birthday next month! To share with my boyfriend when I next see him at the August Bank Holiday. We live a long way from each other so sadly don’t get to see him that often at the moment. My sisters wedding – they would be perfect for the Summer theme ! I don’t need a reason to enjoy Hotel Chocolat chocolates! Indulging in a box is good enough reason in itself! We would take it to disney land with us! We are going for our little girls 4th birthday next month and could use it on the train as a treat! Don’t need a special occasion – just because its Tuesday and my friends coming round night! I’d share most of them with my family, but I think I would hide away a few choccies to enjoy in perfect peace when my girls both go back to school in September. I would like it for my father’s birthday at the end of this month. He is very nice and shares his chocolate! Important events like….everyday. I love Hotel Chocolat! to cheer me up on yet another rainy day here, summer has been a total washout so far! my birthday next week, then I wouldn’t have to share! I would love it as a treat to celebrate two stone weight loss (and put it all back on again!). I’d love it as a house warming gift for my mum and dad! A perfect present for my beautiful fiance to say thank you for agreeing to marry me ! I would want the box of choccies for my pamper day. I’m not getting a proper holiday this year so I’d keep them for the one day I’ve booked off as a treat to myself! For me and my husband to share when we go to the Lake District for a luxury weekend away. girlfriends 50th birthday and putting up with me for 12 years. I would like an anniversary gift for the husband! My lovely mum has a special big birthday later this year, so I would give these gorgeous chocolates to her. Does one really need a fancy occasion to enjoy wonderful chocolates?! I think not!!! Looks nice for big family weekend away we we all travel to somerset. I would like the chocolates for my husband to celebrate our 40th wedding anniversary. Hopefully he would share ! Perfect for our first Wedding Anniversary next month! and perfect for any other occasion, actually…….yum!! d save them for everyone to enjoy after an afternoon BBQ in the garden. I would just love these to share with the children, I am good at the moment and don’t buy much chocolate, so these would make a lovely surprise for us all and ive heard this brand is lovely. for relaxing after a hard week at work and as my treat for being on a diet. I would have them at my big summer house warming bbq! I would give them to my daughter for her birthday in September. We always have a huge family BBQ each summer. They would be great to pass around later in the evening. It’s my wife 50th birthday party this month, and passing these around would be fab! I turn 30 in September so these would be fab treats to share with my lovely work colleagues! I would give it to my mum who has been so supportive to me, my wife and children across the years and is a chocaholic! We love having friends over for dinner and this would make a perfect after dinner snack! for my birthday, I love chocolate so this would be the perfect gift for me. For my fiance’s birthday, these look delicious! I adore Hotel Chocolat, and I don’t really need an excuse to indulge! However, I think the ideal time would be during a girls night in coupled with plenty of prosecco. I’d love to win these to share with the GF. We loved the Hotel Chocolat range of Easter Eggs. I’d love to win these as a Birthday treat for my Daughter this weekend. I would like this collection at a summer gathering of the family and a chance to spoil everyone. These would be perfect for cheering up my friend who is havinng chemo. Would love to win for my mum’s birthday in August as I think this may be the only sign of summer we’ll be seeing!! This would be perfect for my ‘me’ time – when the kids are in bed and the ironing is finished! I would like to have a date with Carol Kirkwood of BBC Breakfast ( Weather Girl ) on which I would bring her the collection. Just about any occasion I’d think but I have a family wedding approaching so it’d be nice for that. I would love these for my daughter who will be receiving her GCSE results in a couple of weeks. She has worked so hard and studied so much, that this would be a lovely little treat for her the night before her results, so she knows that regardless of her results, her dad and I are so proud of her! She is also a chocoholic! Sorry pressed enter before I had finished. I would love to win for my Daughters 18th birthday, she really deserves them. These would be perfect for our first wedding anniversary, as we can’t really celebrate with a glass of champagne as I’m 5 and half months pregnant! Ooh, good choices Cat, though I wasn’t sure if that was one or three different chocolates. Would be glad to give them for our anniversary. With my gorgeous husband, In the garden on our rocking swing, eating some choccies with a glass of wine enjoying the sunset! Kiddos in bed… PERFECT!! I reckon you could have a ‘Congratulations on your divorce’ box of chocolates, with a bottle of wine to wash it down! I would love this for my partners 21st birthday!! Such a special occasion deserves the best!! I would love to win this for my best friend Megan. We have been best friends since birth and are about to celebrate 30 years of friendship (we both share the same birthday, both turning 30). This would be perfect to mark the special occasion. Thanks for the chance. Wow, 30 years of friendship since birth. How wonderful. I never need an occasion to eat chocolate but i would share them with my dad. a rainy afternoon on the sofa, Pretty Little Liars back to back…….. and chocolate! I would love it to give to my partner for his birthday. These would be perfect as a finish to a summer barbecue with my friends! Hotel Chocolat are the best. To celebrate an amazing summer with the best BBQ for all my friends and family with partying all the way into the small hours. My husband is going away on a course…so I would eat them in secret to cheer me up!! I would love to share these with my children while we spend some time together in the holidays, and also with my mum and sister as I would love to give them a treat too. This is a lovely prize, Hotel Chocolat is by far the best.